Map Layout: 9	This map is extremely cliffy, and the bases are either in-between many cliffs or on a somewhat larger cliff. 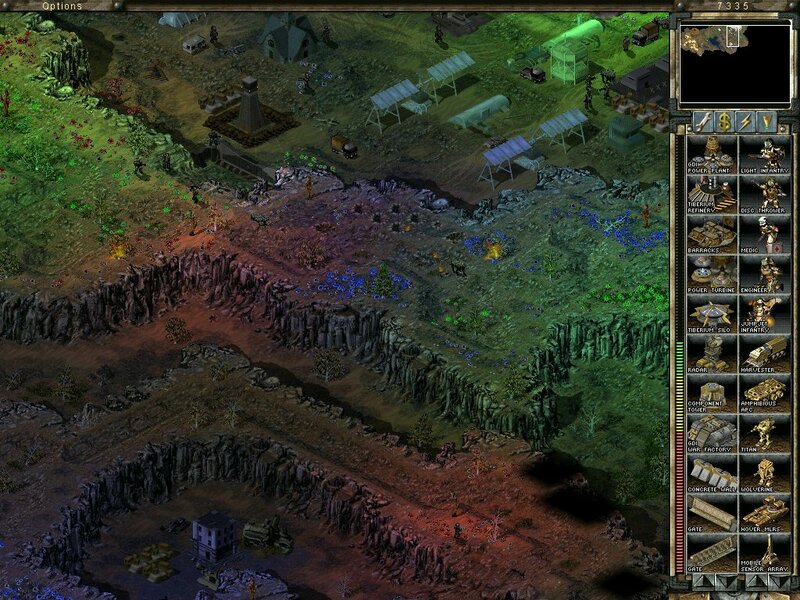 Tiberium is mostly on cliffs, many of which have to be accessed by backdoors or by destroying a destroyable cliff (duh). The bases that are in-between cliffs have many narrow entrances, which makes defending quite easy; the bases on cliffs feel somewhat more vulnerable but they benefit from their height advantage. The only gripe I have are that there are some rivers/waterfalls that don't make sense, but apart from that the layout is very good. Eye-Candy: 9	This map is very detailed, with no undetailed areas at all. Detailed Tiberium pits are everywhere, it's a pity this is not a Firestorm map though. The tiberium is very well lit by invisible lightposts, a lot of attention has been paid to making it look just right. There are a few minor errors (shore errors ) but these are easily forgiven because there's so much to see on this map. Triggers: 5	There are a lot of meteors in this map and they come in all sizes and shapes. Adding meteors isn't exactly complicated though, but they are a nice touch anyway. Map Layout:	8/10	The map layout is great, however the cliff is too close in some places and the water shore doesn't "go together". Eye-Candy:	6/10	Ideal amount of tiberium, neutral base was a nice added touch. Playability:	4/10	Like I said, the cliffs were too close together in some places so men can't pass through them (like at the ONLY entrance to a base). Not all players had even amounts of space. Triggers:	6.5/10	Meteor showers were a nice touch, along with making each starting unit a star status unit. Map Name: Treacherous Lands (2-6). Size: 165×120 (About the size of Tread Lightly). Instructions: Place in /Sun Folder. ;p The .zip contains 2 maps; The normal version of map & a DEBUG version, DEBUG version simply has a reveal all trigger so play that if you wish to examine all the detals, DEBUG version also has Untruncated comments so you can view some of the 'ini scripting'. Description: In this tiberium world, some places are more dangerous than others; some places are more mysterious than others, this is one of those places, a disbelieved yet feared place, it is said this place is where a massive meteorite once hit the earth; long, long ago, before dinosaurs, however, what does this have to do with it? Well, as you know 'tiberium' only recently appeared on Earth, it was thought it first came to the planet via the meteor that hit near the Tiber River, however this is not the case, indeed, tiberium first arrived at the place known as the Treacherous Lands. But you ask, this cant be true, tiberium was never spotted here? Well well, while this was the first harbinger of tiberium, it was not like the one at Tiber River, the one at Tiber River was a fast growing green tiberium that was like a weed, the one that came in the meteorite at the Treacherous lands was something completely different; A 'rare' & strange dark red tiberium, it never appeared because like an egg it had not been fertilised, what people dont know is that amany of the meteorites that hit earth contained tiberium, but they where the type that required fertilising. Green tiberium was the answer to these tiberiums, green tiberium is a monster of the tiberium world metaphorically speaking, it is not very explosive in comparison to these other tiberiums, however it grows & pollutes an area at far greater speed, plus is grows at extreme rates; the truth is that the purpose of Green Tiberium is to reproduce, the blue, red & any other type of tiberium are all sedantry, & grow very little or none, green tiberium helps tiberium grow & nourish, the seeds where already on earth, they just needed to be planted, to be planted by Riparius. & this comes to the next point, The Treacherous Lands, this was the first place tiberium came to earth, the tiberium carried on this meteorite is unlike any other seen on the planet, it has only sprouted recently at a very fast rate, this is how it came to light, this tiberium is a dark & vivid red, it glistens & glows like some sort of energy is trapped within it; it has finally arrived that green tiberium has fertilised even the most remote area's, Aboreus has been awaken; another sign of how fast this world is becoming that of a changed ecosystem that excludes humanoids. GDI & Nod have both witnessed this new appearance in the tiberium world, both are scrambling to examine the crystals closer, they will both try & unscramble the strange mysteries yet to be discovered, but both will fight over the right's to examining this land, & this is where you come into the plot commander, you will venture forth into these treacherous land's while you still have human eyes. it with the zip when sent to the judges? I really don't agree with Dew here! This is simply untrue. All bases have 2/3 working entrances. Thanks for the well wrote review DvD & thanks for the honesty DeW. & Thanks for standing up for me DvD, lol, i did personally test my map of course & each base definitely had atleast 2 entrances that worked.